According to Super Smash Bros.  fans, the first rule of Super Smash Club  is that you must talk about Super Smash Club. 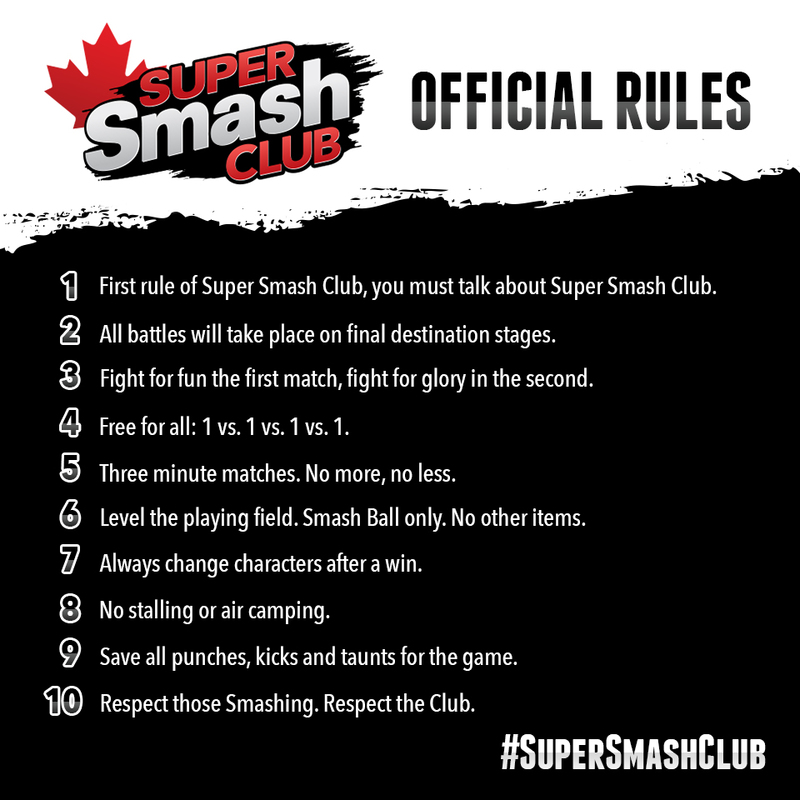 This rule and nine others were created by die-hard Canadian Super Smash Bros. fans after Reggie Fils-Aime, president and chief operating officer of Nintendo of America, issued a challenge to create the rules for the Canadian-exclusive Super Smash Club in advance of the launch of the Super Smash Bros. for 3DS game. Reggie’s video challenge was a Canadian-inspired production, featuring maple syrup and hockey players. In it, Reggie also asked Canadian Super Smash Bros. fans and players, noted among the best in the world, to share their excitement for the franchise on social media using the hashtag #SuperSmashClub, and show their support by attending upcoming Super Smash Club events across the country. First rule of Super Smash Club: You must talk about Super Smash Club. All battles will take place on final destination stages. Fight for fun the first match, fight for glory in the second. Free for all: 1 vs. 1 vs. 1 vs. 1. Three-minute matches. No more, no less. Level the playing field. Smash Ball only. No other items. Always change characters after a win. No stalling or air camping. Save all punches, kicks and taunts for the game. Respect those Smashing. Respect the Club. Nintendo of Canada Announces New Super Smash Club Gatherings! The first Super Smash Club gatherings announced in September filled up quickly, and extra Super Smash Bros. gatherings have been planned to meet fan demand. Additionally, Nintendo of Canada has partnered with Future Shop to host in-store fan gatherings at select locations in cities across Canada. Fans are encouraged to bring their Nintendo 3DS family system to battle and enjoy StreetPass interactions with other players. For more information on all Super Smash Club gatherings, please visit the Super Smash Club  page. *NO PURCHASE NECESSARY. Open to Canadian residents age 13 or older. Odds of winning depend on number eligible entries received. Contest closes 11:59 PM EDT October 10, 2014. Math Skill Test Question required. Ten winners will be selected at random to each receive one (1) piece of Super Smash Bros. branded merchandise, ARV $5. See Official Rules on the Super Smash Club  page for more details. Super Smash Bros. for Nintendo 3DS launched October 3 and marked the first time the franchise is on a portable system. New characters, items and arenas add a freshly reinvigorated look and feel to this well-loved fan favourite. The game features an astonishing amount of modes, ranging from multiplayer battles that can be played locally or online for players with a wireless broadband Internet connection, to a wide-reaching variety of single-player experiences. For more information about Super Smash Bros. for 3DS and Super Smash Bros. for Wii U, visit the Super Smash Bros.  official page. 1 Comment To "Super Smash Bros. Super Smash Club Rules And Events Revealed"